Bhongir Fort, situated in Historical Municipal Town just 45 KM from the Hyderabad City, well connected with Bus and Train route, on the way to Yadagirigutta and just 14 KM far from Yadagirigutta. 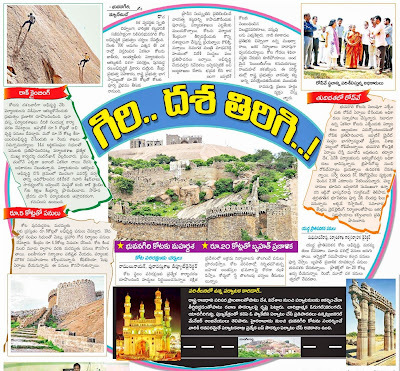 even with all this good qualities the fort was very much neglected by the AP Government Since decades, at last officials focused on the fort to develop it just before the formation of the Telangana state, as telanganites have been raising their voices that why the govt not concentrating the development of important places in telangana, why they are showing the bias. 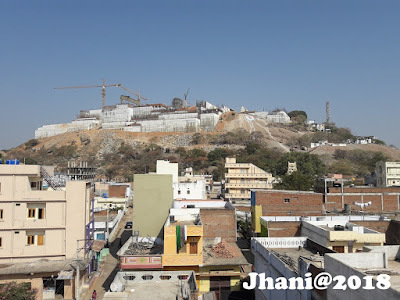 Since my college days i have been very attracted with this fort and went to see it, ( see more about bhongir and photos here ) and dreamed to see a great place. since last two dacades we have read so many paper news and videos in channels but there was no serious action from the officials. expecting they do this time.. if not also no problem, since the Telangana state is very near to form, the new government of Telangana will be surely develop this area Bhongir, Yadagirigutta, Kolanpaka etc., as the telanganite know the History and important of this locations. 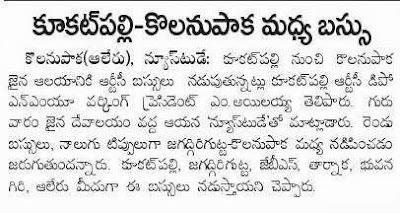 A New Bus services was recently started between Kukatpally to Kolanpaka by APSRTC. ( See more about Kolanpaka clikc here ) Kolanpaka also a great historical place which is located exact borders of Nalgonda and Warangal Dist. the bus services route will be like this Kukatpally-Jagadgarigutta-JBS (Secunderbad bus station)-Tarnaka-Uppal-Bhongir-Alair and two busses will be run 4 trips every day. said KPHB NMU working president M Ailaiah. At last Officials noted the important of the Kolanpaka just before the formation of Telangana ??! !